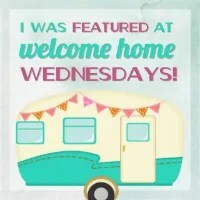 Welcome to Welcome Home Wednesdays #36!!! Whoa, the spring weather has heated up this week. It’s acting like summer – Almost 90 degrees here in the NW! I hope you’ve had a productive week and I can’t wait to see what you’ve been up to. I so appreciate you visiting every week! Thank you! Good morning! Early bird gets the worm 🙂 Thanks for partying with us! Thanks for the party and I hope you have a great day! Thanks for coming by, Leigh! So nice to see you here! Have a wonderful week! Thank you ladies for the party, love the vintage step stool and spring wreath. They are great. Such creative ladies! Thanks for partying with us! Have a super day! Hi…thanks for hosting this fun link party. Have a great rest of your week. Thanks for linking up and partying with us! Love seeing you here! Wow, you’re having better weather than me, it’s rainy and cold here… Thanks for the party Erin!! Another great day here. Sorry about your rain and cold. Nice to see your smiling face here! Have a super week, Katrin! Thanks Erin for hosting the party. Have a nice week. Thank you for coming over and linking up, Sadhna! I hope you have a lovely and productive week! Such an awesome link party! I’m glad I found you and I’ll make sure to be here more times. Thank you for the opportunity, Erin. Thank you so much for stopping by our little party, Debbie. So nice to meet you! Have a wonderful day! Thanks for being here every week! Love seeing all your yummy creations! Thank you for the wonderful party! I appreciate you working so hard to share other bloggers content. I would love you to visit #WonderfulWednesday or #ThursdayFavoriteThings so I can return the favor! Have a great week. Don’t forget to comment your link #’s so I can be sure to visit. The more shares the bigger your audience! My features are chosen from these link numbers! Thank you so much for the lovely feature of my spring wreath! I always enjoy linking up with you ladies!